Grove Road Bridge No 96 is a minor waterways place minor waterways place place on the waterways major waterways place village town city on the Huddersfield Narrow Canal between Ashton-under-Lyne Junction (Junction of Ashton and Huddersfield Narrow Canals) (4 miles and 4¼ furlongs and 8 locks to the west) and Royal George Aqueduct (3 miles and 2 furlongs and 9 locks to the north). 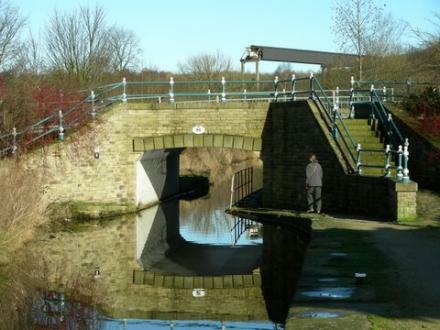 The nearest place in the direction of Ashton-under-Lyne Junction is Waterways Office (Manchester and Pennine Waterways, Stalybridge) - Canal & River Trust; ¼ furlongs away. The nearest place in the direction of Royal George Aqueduct is Swineshaw Brook Aqueduct; ¼ furlongs away. This is a pinch point. The normal maximum dimensions for a boat on this waterway are 72 feet long, 7 feet wide, 6 feet and 11 inches high and 2 feet and 11 inches deep, but to pass through here the maximum dimensions are 6 feet and 6 inches high. Mooring here is tolerable (it&apos;s just about possible if really necessary) , mooring rings or bollards are available. C&RT Grove Road Depot with hardstanding. Facilities: chemical toilet disposal, showers, toilets and water point. 48 Fold Crescent Carrbrook, Stalybridge, SK15 3ND — 1547 yards to the northeast. windermere rd, Stalybridge, SK15 1EL — 1476 yards to the west. Stoneyfield, Manchester, SK15 1HE — 1451 yards to the west. Stalybridge — 1526 yards to the southwest. Ullswater terrace, Stalybridge, SK151EL — 1369 yards to the west. 7 Windermere road, Stalybridge, Manchester, SK15 1EF — 1509 yards to the west. Manchester, SK15 1HY — 1163 yards to the west. Millbrook — 1078 yards to the east. Manchester — 261 yards to the south. weir mill manchester road, Mossley, OL59QA — 1168 yards to the north. Unit 1 Weir Mill, Manchester Road, Mossley, OL5 9QA — 1302 yards to the north. Stalybridge — 1447 yards to the west. Stalybridge, Stalybridge, SK15 2QE — 1612 yards to the southwest. Stalybridge — 1053 yards to the east. Demesne Drive, Stalybridge, SK15 2 — 1259 yards to the south. Beaconsfield Terrace, Manchester, SK15 3 — 821 yards to the northeast. Heyrod Community Centre, John Street, Heyrod,, Stalybridge, SK15 3BS — 377 yards to the northwest. Stalybridge — 1313 yards to the northeast. 515 yards to the southeast.